Google has scooped up Quickoffice, their second acquisition in as many days, in a move to shore up their mobile productivity suite. Quickoffice currently offers one of the better mobile office experiences for Android and iOS, something that Google certainly wants to take advantage of in their own App product suite. 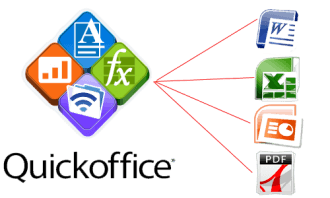 Quickoffice Pro and the HD variant allow users to edit any Microsoft Office document, albeit at a cost of $19.99 (iPad). As we have seen in the past, Google typically does away with any end-user fees after an acquisition which would certainly be an added benefit in this case. The company also released ProSelect HD earlier this year as an enterprise-level suite that is able to let companies with Android tablets and iPads maintain a secure and centrally-connected mobile document editing solution that works with select cloud providers. PCWorld points out that the timing of the acquisition is interesting as we are still waiting for Microsoft to come out with an Office suite for Android, iOS and Windows tablets. Last we heard, Redmond was expected to announce such an app sometime in November of this year. This move by Google could be viewed as a “preemptive strike” against Microsoft. Quickoffice got their start in 1997 and have raised $28.5 million since then. The company claims their software is installed on over 300 million devices spanning more than 180 countries worldwide. Neither company provided financial details regarding the acquisition.